Joining Villa Preferred Access scheme could be one of the best decisions you ever make concerning your future vacations. This program is currently being offered to timeshare buyers who purchase from Villa del Palmar resorts in Mexico. There are many benefits to this scheme but here are our top 5. When you become a Villa Preferred Access member at a Villa del Palmar resort you immediately gain access to all Villa del Palmar resorts in Mexico depending on your points level. This includes the resorts Villa Preferred Access resorts in Cancun, Baja California, the Islands of Loreto, Puerto Vallarta and Nuevo Vallarta. You can spend your vacations in any of these resorts when you so wish! One of the top benefits of becoming a Villa Preferred Access member is the quality you will experience every time your visit a Villa del Palmar resort. 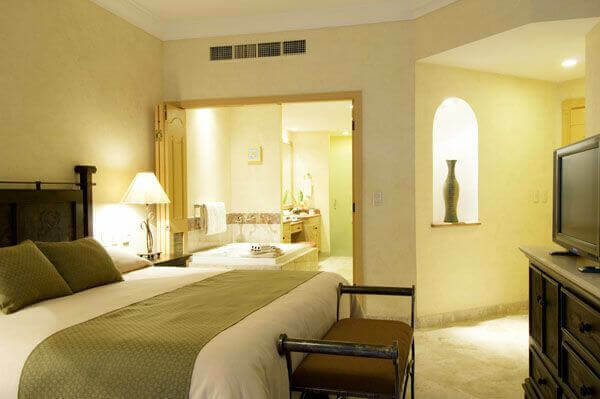 The accommodations on offer to Villa Preferred Access members are some of the highest quality accommodation in Mexico. Every unit is finished to the same high standard and furnished with the very best appliances and furniture; if you are used to luxury then you won’t be disappointed. When you become a Villa Preferred Access member, you become a part of the Villa del Palmar’s points based system. This means that you are essentially buying points equivalent to a unit, rather than being limited to using allocated fixed weeks. This means that you can take your vacations at different times of the year, or every other year, if you wish. In order to make sure that you can get what you want every year, and not lose out if you need to miss a vacation, the Villa Preferred Access scheme allows you to bank and borrow points. You can also opt to up or downgrade your units on a yearly basis in order to take longer, more economical vacations, or shorter but highly luxurious ones! The services on offer to Villa Preferred Access members at all Villa del Palmar resorts are exceptional! You can use your points to purchase pre-paid, all inclusive meal plans, or even a private chef in your room, if you wish. In addition to this, the facilities are amazing; pools, secure beaches and gourmet restaurants abound ! This timeshare membership is packed with great benefits, but the proof is in the first hand experience.